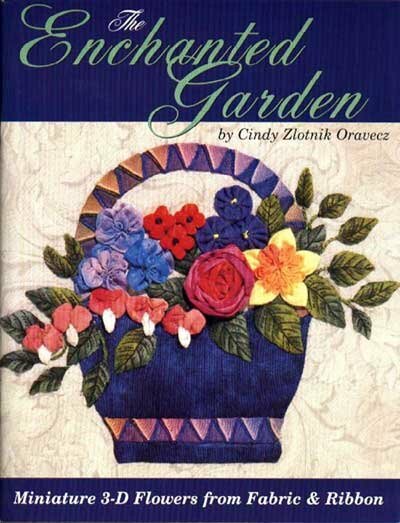 Step into "The Enchanted Garden" with Cindy Zlotnik Oravecz. This is where the tiniest of dimensional flowers grow in an inspiring rainbow of colors. You will find some old favorites from her first book, "Into The Garden", but in a much smaller size. There is the ever-charming Bleeding Heart, the rolled and ruched Hepatica, silk ribbon stars the Mum and the Pansy, the Old-Fashioned Rose and the quick Wildflower. She's added some new blossoms to the garden. The sunny Daffodil, the Rosabella, the smallest flower of all, and a Sunflower are all growing in miniature as well, as we journey together into "The Enchanted Garden". This collection of dimensional flowers contains patterns for nine new 6-inch square quilt blocks. 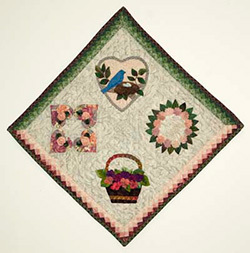 All nine blocks can be combined into one nine-block wallhanging, a four-block wallhanging or a single-block center medallion wallhanging surrounded by borders. The patterns work well on wearables, too. As usual the instruction includes variations to choose from, so your work can be one-of-a-kind. With the help of a few simple design rules, it’s exciting to unleash your creativity and see where it leads.